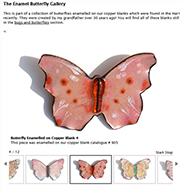 Copper Blanks - Other Shapes - Drops - Page 1 - Harrison & Harrison Craft Supplies Ltd.
Visit our Butterfly Gallery and see other creative uses for our copper blanks on our Ideas and Inspiration page. "I really like your copper because it takes less work to smooth the edges and buff the surface. I am glad I found your company and look forward to a long relationship"
"You are so good to work with and I thank you very much"
"You were very efficient, and I received the items I ordered very quickly"
"Your product was excellent, and I plan to order many more in the future"